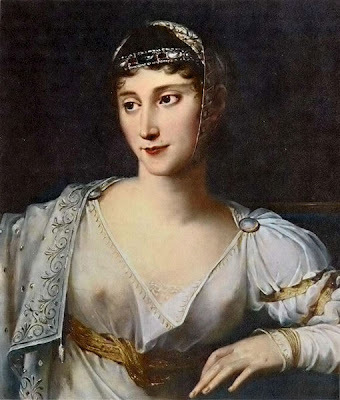 Despite being married to Camillo Borghese, Napoleon’s sister Pauline had many lovers. Instead of conducting her affairs discreetly, she and her lovers behaved almost as if they had been a married couple and, unless people had seen pictures of her husband, they could easily mistake her latest conquest for her spouse. That’s exactly what happened to the dentist Bousquet, who was one day summed at Neuilly because the princess suffered from a toothache that wouldn’t allow her to sleep at night. When the dentist arrived, he was shown into the room where Pauline was. The princess wasn’t alone. A young man, wearing a dressing-gown, was lying on a sofa. Bousquet examined the patient and realized the tooth would need to be extracted. He started to prepare the instruments for the extraction, but Pauline was now very afraid and refused to have her tooth pulled out. Dentists’ tools look scary today, can you imagine how they looked at the time? Not to mention there was no anesthesia back then! But her companion thought there was nothing to be afraid of. “A moment or two of pain” he said “and it’s over forever… A child could go through with it and not utter a sound.”. “It’s easier said than done”, Pauline replied, “I’d like to see you do it”. He got up, went over to the dentist, pointed to a tooth, which was almost intact, in the back of his mouth and ordered him to pull it out. The tooth was soon extracted without the man uttering a sound. Impressed by this gesture, Pauline submitted to the operation as well. The dentist left the room and reassured the ladies- and gentlemen-in-waiting that the princess was now fine. “Her Imperial Highness is very well, and ought to be well contented with the tender devotion of her august husband. He has just given most touching proof of it in my presence by his extreme solicitude. His anxiety was extreme ; it was only with difficulty that I could reassure him concerning the results of the little operation. It will be a pleasure to me to repeat at Paris what I have just witnessed, a true pleasure to have such instances of conjugal devotion to quote, seeing how rare such a quality is in persons of such high degree. I am indeed touched.” It must have been hard for his audience not to burst out laughing! The young man was Major Canouville, not her husband! The poor naive dentist kept his word too. A few days later, he was talking to a few friends when the conversation fell upon Pauline and her many lovers. Bousquet hastened to defend the Princess. “These are only slanders and malignities” he said. “I saw her at her home, in private, with her husband. They are very close. Their union is perfect!”.